Bhogaraju Pattabhi Sitaramayya was born on 24th November 1880. He obtained a medical degree from Madras Medical College. Between 1906 and 1916 he set up a practice in Masulipatnam, Andhra Pradesh (Granville Austin, The Indian Constitution: Cornerstone of a Nation, Oxford India Paperbacks, 199, Page 346). In 1916, he gave up his medical practice and got involved in the Indian political and freedom movement. He joined the Congress party and was eventually elected its president in 1948. Sitaramayya took part in the Home Rule movement, Salt Saytagraha, Gandhi's individual Satyagraha in 1941 and Quit India movement. He set up an English weekly publication, the Janmabhumi, in 1919, which functioned till 1930. He was elected to the Constituent Assembly from Madras province in 1946 under the Congress party ticket. 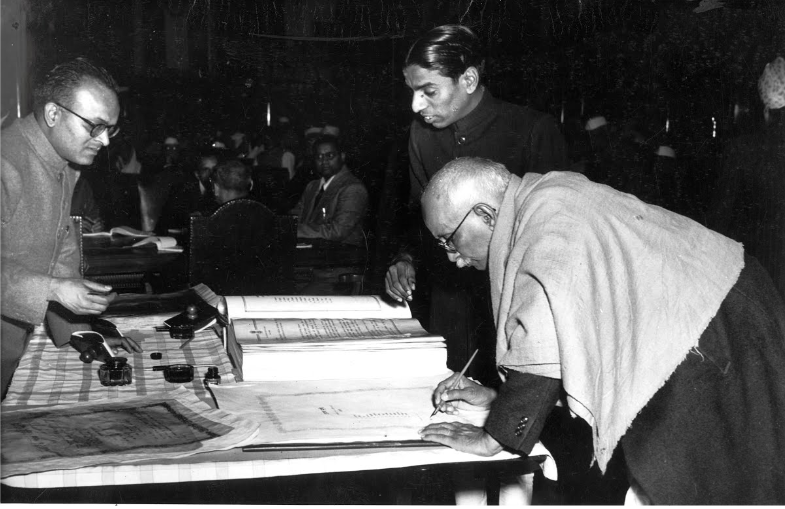 Sitaramayya signing the Indian Constitution. Sitaramayya played a significant role in the integration of princely states with India. He was a member of Constituent Assembly Negotiating Committee which carried out consultations and deliberations with the Negotiating Committee set up by the Chamber of Princes to: arrive at a settlement for distribution of seats in the Constituent Assembly for Princely States as per the Cabinet Mission Plan, 1946 and to settle the mode of appointing members from Princely States. The efforts of this committee were fruitful: 16 members from 7 Princely States took part in the proceedings of the Constituent Assembly on 28th April 1947. He was Chairman of Committee of Chief Commissioners’ Provinces. In its report, the Committee recommended the administrative and legislative set up for Delhi (which became a Union Territory in 1956 and National Capital Territory in 1991) which was adopted by the Constituent Assembly. The committee recommended for a cooperative and co-existing administrative set up for Delhi with Lieutenant Governor appointed by President and an elected legislature to administer Delhi (B.Shiva Rao, ‘The Framing of India’s Constitution’, Volume 3, Page 249, First Edition). He was appointed as the Governor of Madhya Pradesh from 1952 to 1957. Popularly referred to as the 'historian of Indian National Congress', he has written History of the Indian National Congress in two volumes (1935 and 1947). His other writings include: Indian Nationalism, The Redistribution of Indian Provinces on a Linguistic Basis, Non-Cooperation, Some Fundamentals Of The Indian Problem, Current history in questions and answers, Feathers & Stones: My Study Windows. Sitaramayya passed away on December 17th, 1959. Sitaramayya was an active member of the Constituent Assembly and made several interventions. These are all half-truths. A 'revolutionary document' is a contradiction of terms. Revolutions do not yield documents nor documents beget revolutions. We have imitated the 1935 Act because through a fortunate or unfortunate chance, it turned out that it was not through a bloody revolution that we have worked out our emancipation. It was by an imperceptible transition from the stage of bureaucracy and dependence to the stage of a republic and cooperative commonwealth that we have wrought these transformations. The privy purse after all is a small matter. It is the monetary equivalent of the moral surrender of the Princes. Moral surrender is what we want and all honour to the Princes that have readily agreed to such an arrangement. During the discussions on the powers of Governor, responsible governance and political parties, he mounted a defense against separate electorates. He narrated the historical demand for separate electorates and urged the Assembly to forget the bad experience: this will enable the formation of ‘political parties on purely political principles without any communal bias’.